Tourists and Visitors use a variety of maps to plan their visits and to find key locations when they arrive. Maps.com can offer Print and Online mapping solutions to promote your destination. From the hotel, to the visitor center, to the museum, to the conference hall, your visitors will look to printed maps to give them an instant, easy-to-read reference guide for your destination. Maps.com can provide custom styling and content to suit your target audience. From satellite imagery to illustrated maps with themed content and sponsorship opportunities, Maps.com can provide a solution that will exceed expectations. For more examples follow the links on the left. Interactive search tools, driving directions and functionality with your custom content, interactive, online maps help visitors produce the map that they need, instantly. Find out more in this short video presentation. 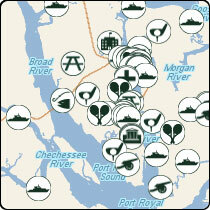 Including sponsored links and online advertising can make your mapping solutions generate revenue. See this 3 minute demonstration video to see how Maps.com can produce interactive maps that work for your website.